Healthy teeth depend heavily on healthy gums for support. Gum disease causes infections, sensitivity and eventual loss of teeth. 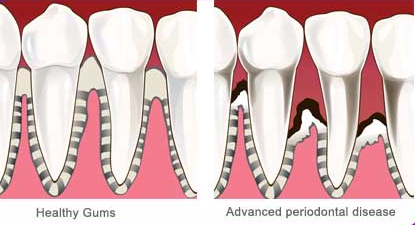 Gum disease (or periodontal disease) is usually caused by the build up of plaque which hardens and becomes tartar. This causes an irritation to your teeth and gums, resulting in an inflammatory reaction to the bacteria that is present. This can eventually lead to the loss of your teeth. The warning signs of gum disease are often ignored. If you spot any of the following symptoms which continue for longer than 2 weeks please contact us. We will be happy to assist you in your treatment and creating a plan to avoid gum disease issues in the future. We can treat a number of ways, but one of the main ways is to clean very carefully under the gums. This procedure is done by placing a local anaesthetic so no pain is felt during the treatment. If we feel there is more treatment required, you will usually be referred to a periodontal specialist who can treat advanced forms of gum disease. ADVICE – Regular brushing and observation of your teeth are ways to help prevent gum disease. For further information on Gum Disease and to book your appointment contact us now.